At the age of twenty-two, when in Romania, I entered a study-abroad program that required a sponsor. 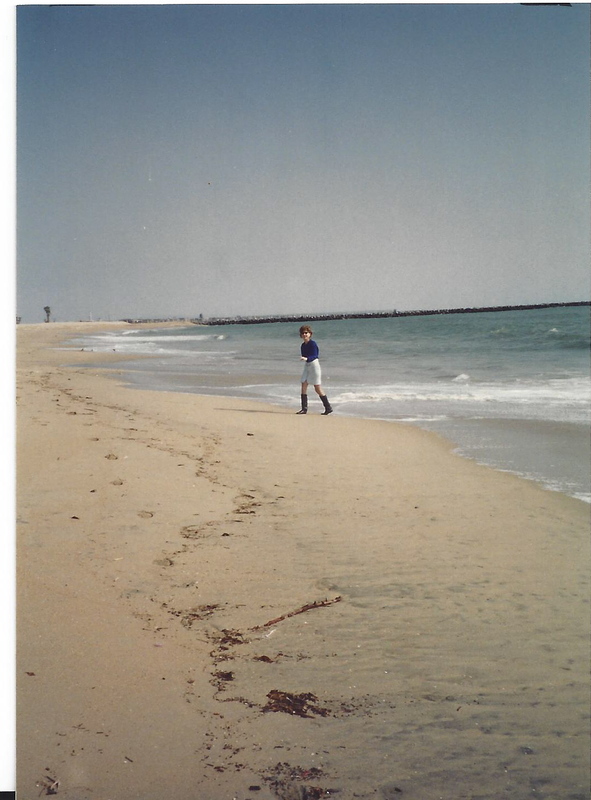 My cousin Luminita, who’d been living in the U.S. with her family for many years, signed on the dotted line, and a couple of months later she snapped one of my first pictures on these shores (see above). Arriving in a new country can be exciting and scary all at once, but the multitude of nationalities here in Los Angeles, of languages spoken, made me feel welcome. I was not, I felt, the only one struggling. Before long, however, I became aware of the tensions this multitude holds. Every country has its problems, but the issues sparked by an often problematic cultural pluralism were new for me. Much of this tension concerned the Hispanic community — there was, I thought, a certain barrier, I don’t know, perhaps a clear refusal to understand one another. Or so it looked to me. Still does, sometimes. 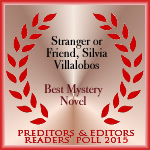 In Stranger or Friend, Zoe Sinclair is exposed to exactly such tension when she returns home. It is the friction caused by outsiders, or viewed by a handful of people as being caused by them, that leads to the big conflict. Much of this reflects my observations from those early days, a time full of hope and dread and joy and so many questions. As my blog tagline says … life is a story, might as well write it. ~ Tomorrow’s post: B is for Beauty. I hope to see you then. The Blogging from A to Z Challenge is almost here. Yay! Hard to believe I’m back after almost crawling across the finish line last year. But who could resist a challenge involving chocolate … I mean, daily blogging. I promise to keep posts short, as I know we’re here to visit a multitude of wonderful blogs, respond to comments, and have a generally awesome time. My theme for the 2015 A to Z Blogging Challenge is INSPIRATION. Now that Stranger or Friend, my mystery from Solstice Publishing, is out in the world, I thought it suitable to show where my inspiration came from. I say show because there will be lots of photographs and little text. Quick observations. Keeping it short, remember? Very short. Inspiration, as I’m sure you know, comes from feelings, life experiences, reading, and so much more. In the writing of this novel, inspiration came from my observations as an Eastern European immigrant to the U.S. There are interminable things a new arrival sees, many invisible or hardly noticeable to locals. While the mystery is the focus, Zoe Sinclair, the main character, deals with a very real and human aspect in all our lives: a certain prejudice that hides in every heart. So, let’s do this. The first post will be titled Arriving. How does arriving to a new place — new country, new continent — at the age of twenty-two feel like? See you on April 1st. Elizabeth’s post moved me as her writing always does. But today’s article is extra special. She writes about Robin Williams, a gifted artist who, as Elizabeth puts it, brought about understanding amongst complete strangers through an expression. You have been gone a while now, but you still touch people and help them connect. This past weekend, my family watched Mrs. Doubtfire. We laughed the whole way through. The kids especially liked the part where you told your ex the drink killed your dearly departed husband. Specifically, when you said he got run over by a Guinness truck, they giggled until they were breathless. I remember watching that movie when it first came out, and being similarly amused. There is something powerful about having that experience twice: by yourself when you are young, and again, with your children. Hearing their laughter makes your heart swell with love. There is a feeling of invincibility.